With the new DC Hose Reels 38 & 50 Dustcontrol releases a new generation of hose reels. With the new DC Hose Reels 38 & 50 Dustcontrol releases a new generation of hose reels. The hose reels are spring operated and due to their smooth operation very user friendly. Simply pull down the hose and it locks in the desired position. Pull it again and the hose rewinds to the starting position. The sealed drum guarantees smooth operation and protects the hose from every day wear and tear. The DC Hose Reels can be installed either on the cei­ling or on the wall. The new generation is more sturdy than its predeces­sor and has a longer reach and a wider radius of action due to the extended anti-static hose. The DC Hose Reels are applicable to all our source extraction systems, providing efficient source extraction for various needs. They are designed to be solid and maintenance-free. 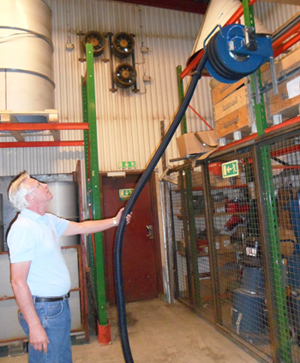 The DC Hose Reel was received very well by the markets and landed directly a huge order by an Austrian customer.